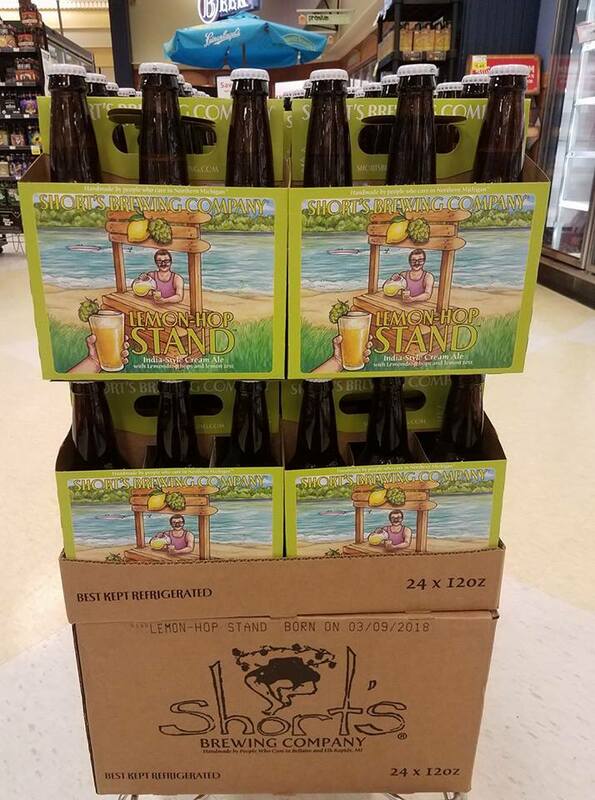 GRAND RAPIDS, Mich. – Just in time for warmer weather, SpartanNash store shelves throughout Michigan are now stocked with an exclusive beer selection – Short’s Lemon-Hop Stand, an India-style cream ale made just for SpartanNash and its retail stores. Featuring lemon drop hops with flavors of sweet grain and soft lemon spice followed by a sizable grassy bitterness, Short’s Lemon-Hop Stand features 70 IBUs and an ABV of 7.8 percent. Seventy-five Family Fare Supermarkets, D&W Fresh Market, VG’s and Forest Hills Foods locations will carry the SpartanNash-exclusive beer, with only 1,200 six-packs of the limited-edition beer available for purchase. “As a Michigan-based company for more than 100 years, we wanted to team up with another local company to create this one-of-a-kind beer, and the result is a delicious, unique beer that’s perfect for the spring and summer,” Executive Vice President of Merchandising and Marketing Larry Pierce said. “Our stores are known for their wide selection of Michigan craft beers, and this Short’s Lemon-Hop Stand will be an added treat for our local beer lovers. Short’s Lemon-Hop Stand six-packs retail for $9.99. SpartanNash (Nasdaq: SPTN) is a Fortune 350 company whose core businesses include distributing grocery products to independent grocery retailers, select national accounts, its corporate-owned retail stores and U.S. military commissaries and exchanges. SpartanNash serves customer locations in 47 states and the District of Columbia, Europe, Cuba, Puerto Rico, Italy, Bahrain, Djibouti and Egypt. As of today, SpartanNash currently operates 143 supermarkets, primarily under the banners of Family Fare Supermarkets, D&W Fresh Market, VG’s Grocery, Dan’s Supermarket and Family Fresh Market. Through its MDV military division, SpartanNash is a leading distributor of grocery products to U.S. military commissaries.